After our visit to Canyonlands NP and Deadhorse Point SP it was time for us to head back east. As planned previously, the colorful fall foliage of the Colorado Aspen trees would be at or near their peak colors as we drove back through Colorado. We spent a couple of days exploring areas of the San Juan mountains that we had not visited before, and were treated with some spectacular views. 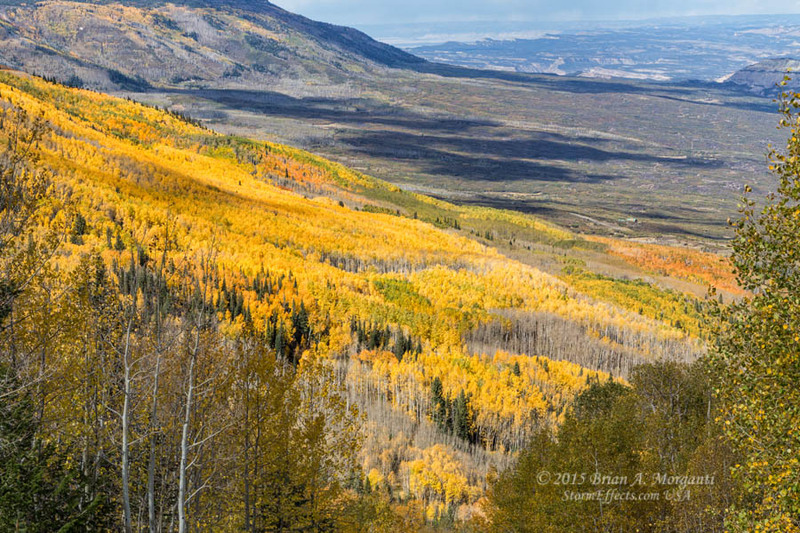 Aspen Vista - Mesa, Colorado: An afternoon view of the blazing yellow and orange Aspen trees as viewed to the west of Highway 85 on the climb to Grand Mesa. 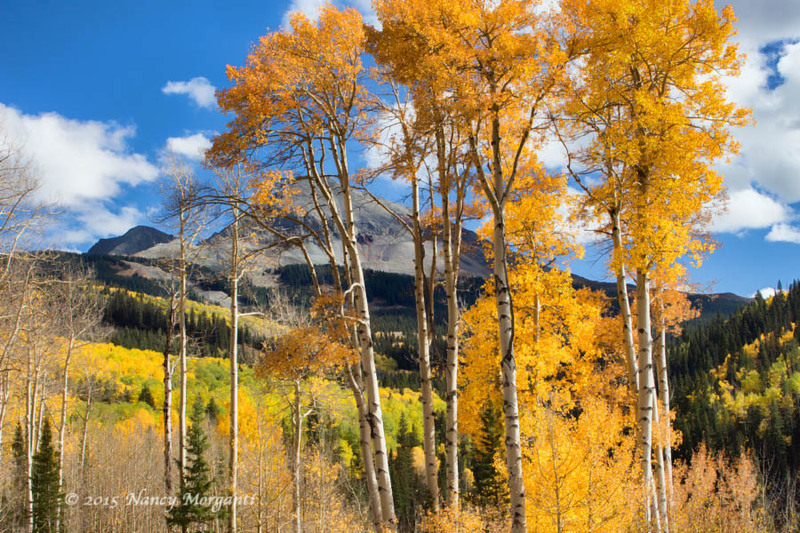 Aspens & Mountains:. 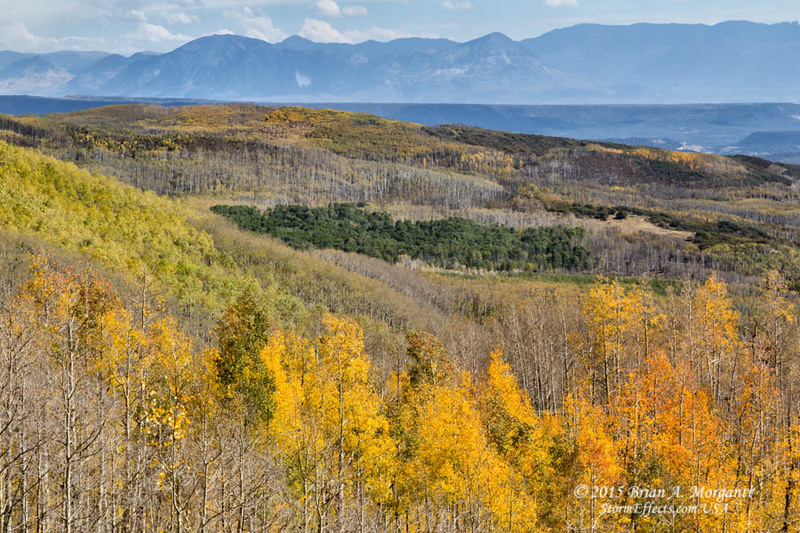 The West Elk Mountains and Aspens as viewed from the Old Grand Mesa Road above Cedaredge. 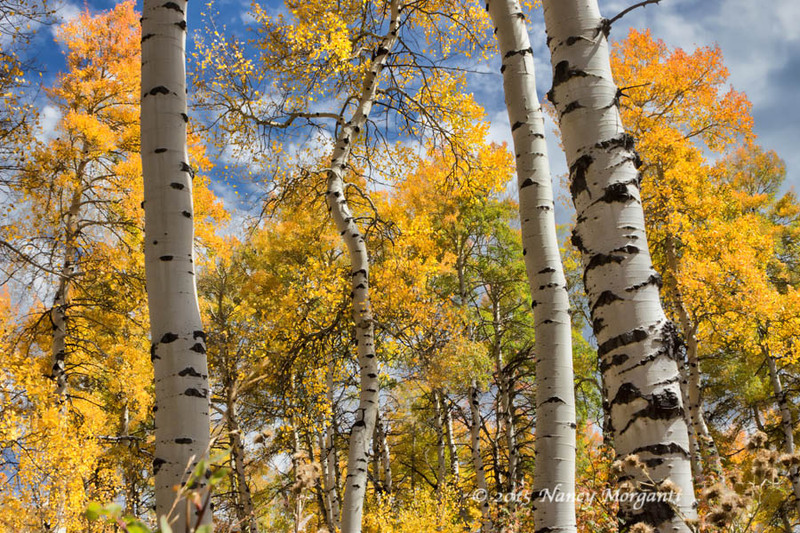 Aspen Leaves & Trunks - Grand Mesa Colorado: A nice combination of colorful Aspen foliage and Aspen tree trunks. 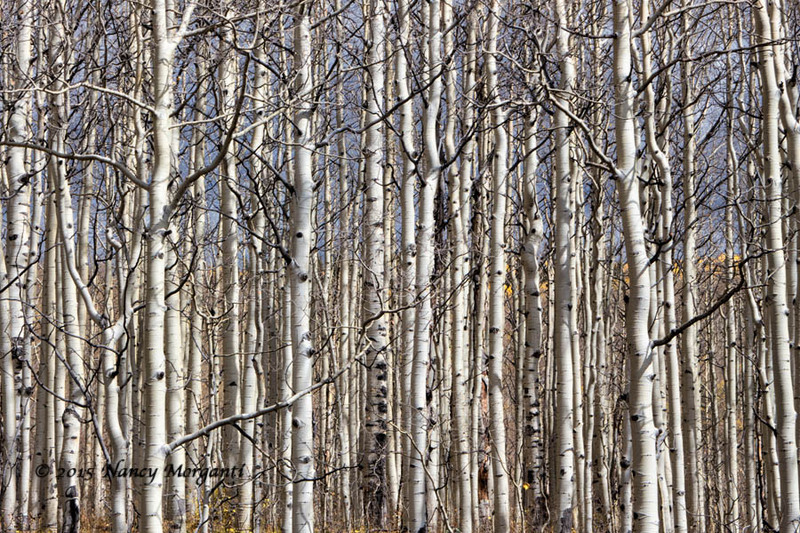 Aspen Jungle - Grand Mesa Colorado: A very tight cluster of Aspen trees that had already lost their foliage for the season. 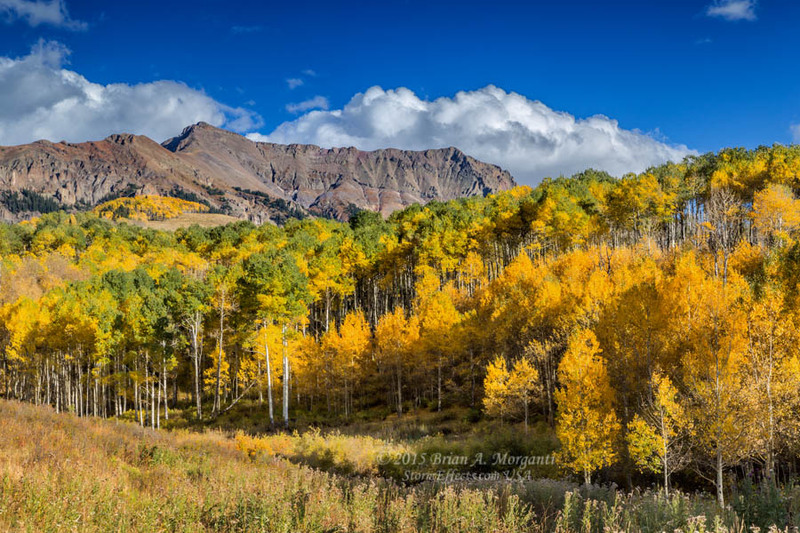 Aspen Meadow - Grand Mesa, Colorado: An inviting glen amid the the fall foliage on a warm autumn afternoon. Shaded Aspens - West Dallas Creek Road - Ridgway, Colorado: A view of the San Juan Mountains being illuminated by the late afternoon sun. 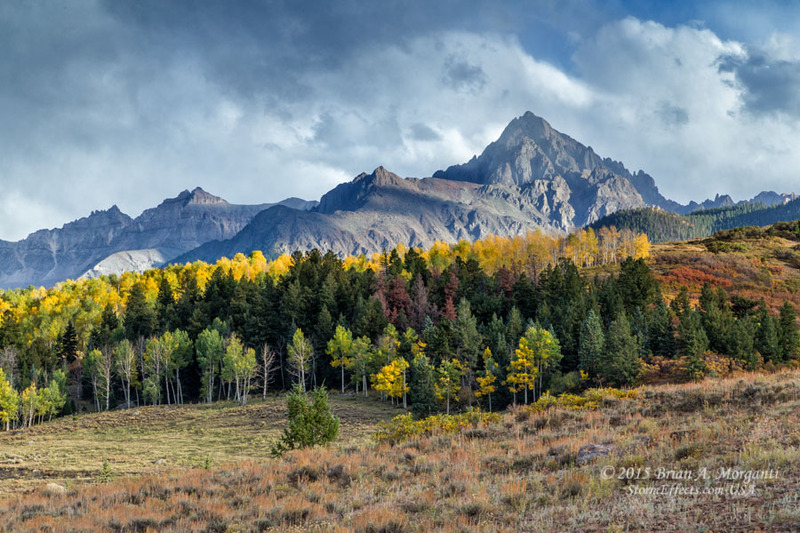 Mt Sneffels - West Dallas Creek Road - Ridgway, Colorado: Storm clouds gather over Mt Sneffels on an early October evening. 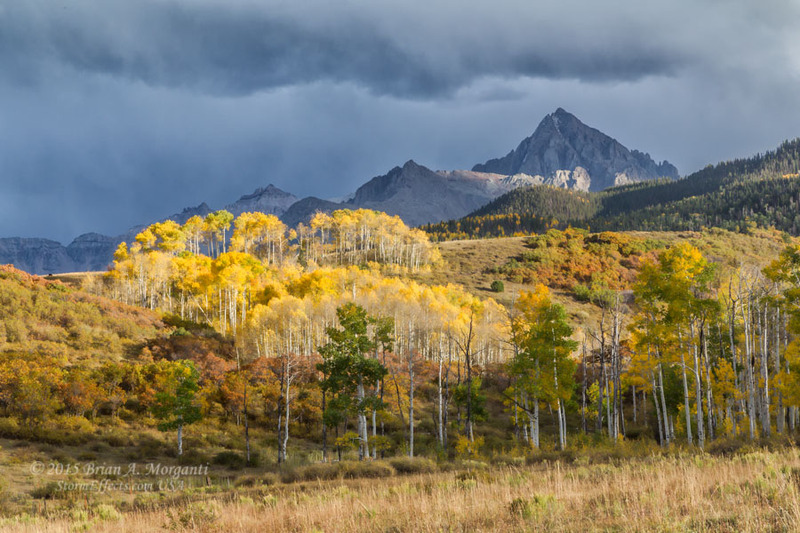 Sunlit Aspens - West Dallas Creek Road - Ridgway, Colorado: A bright shaft of sunlight illuminates the Aspens as storm clouds move in over Mount Sneffels. 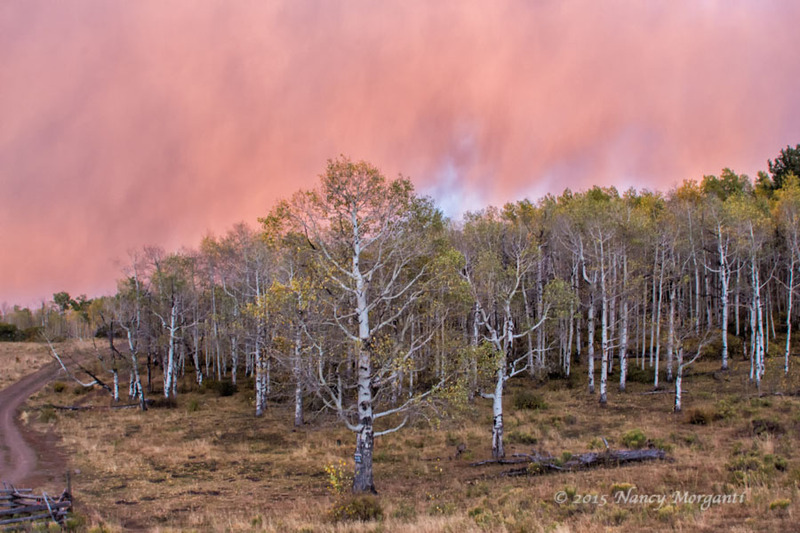 Stormy Skies - County Road 5 - Ridgway, Colorado: The setting sun painted the sky in shades of red after a small storm developed near the town of Ridgeway. 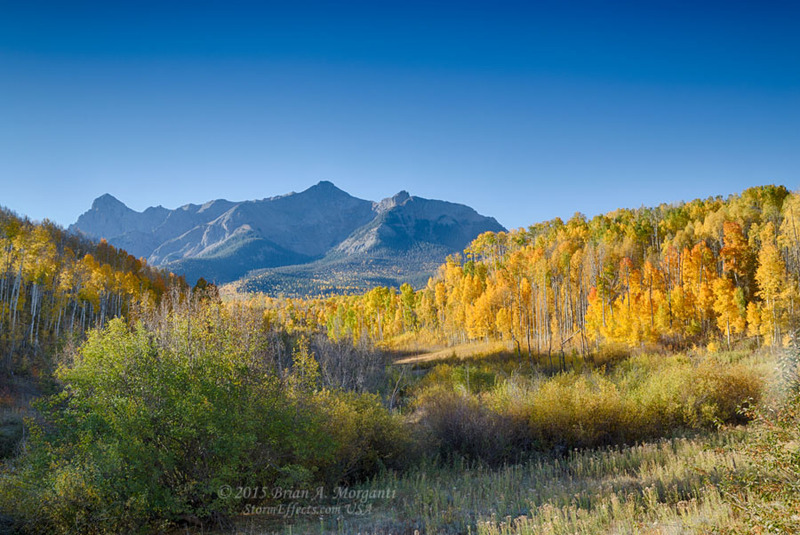 Dallas Divide Panoramic - Ridgway, Colorado: A pre-sunrise view of the Dallas Divide from along the San Juan Skyway west of Ridgeway. 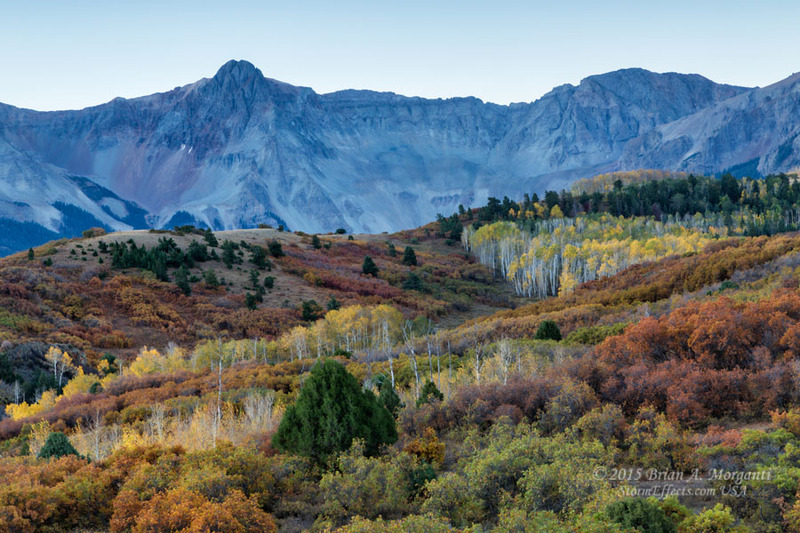 Dallas Divide & Aspens - Ridgway, Colorado: A small cluster of Aspens glow even before the sun rises in this view of the Dallas Divide. 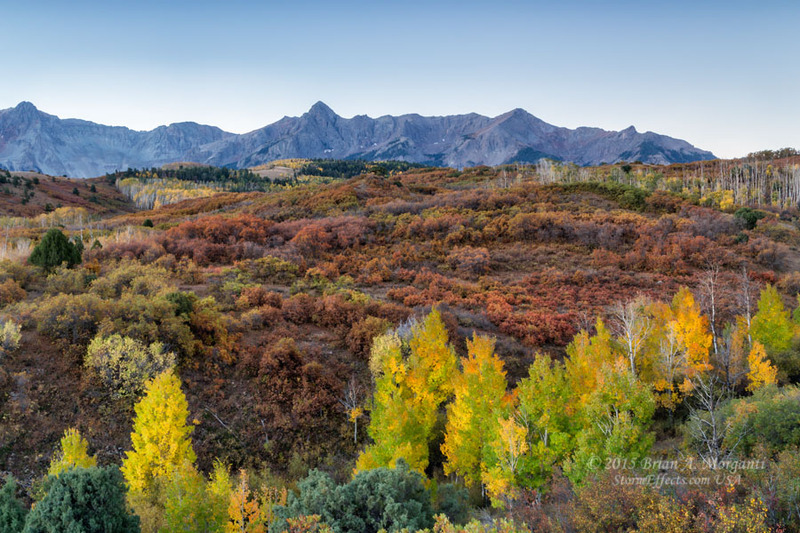 Dallas Divide - Ridgway, Colorado: Colorful Aspens trees and scrub oaks share the rolling hills in front of the Dallas Divide. 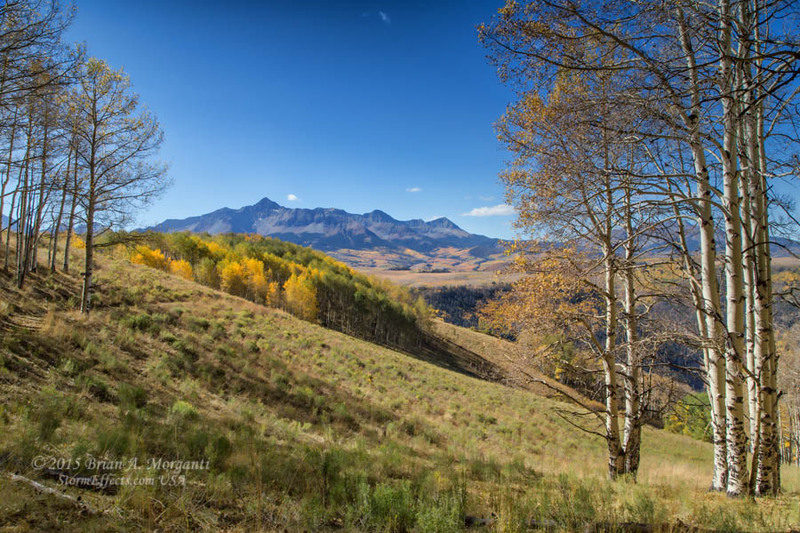 Mountain View - Last Dollar Road - Ridgway, Colorado: An early morning view looking south from near the northern entrance to Last Dollar Road. 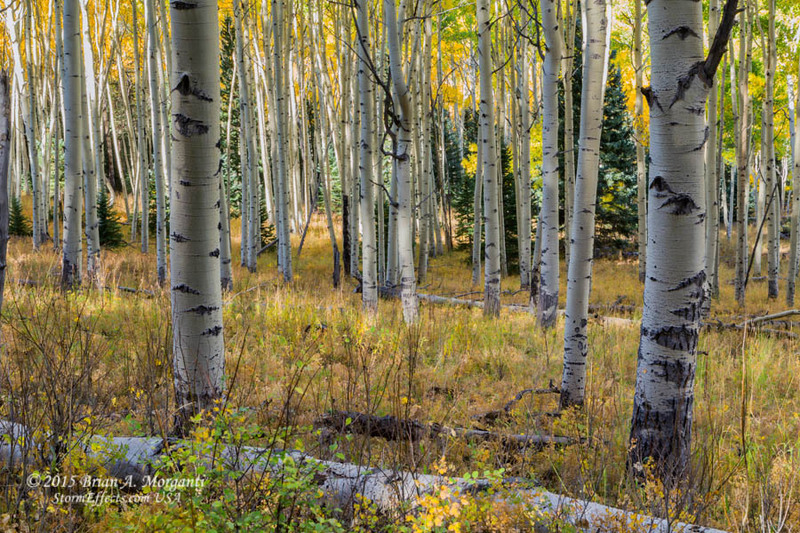 Aspen Forest - Last Dollar Road - Ridgway, Colorado: Morning light illuminates the forest floor in this Aspen forest located on a high point along Last Dollar Road. 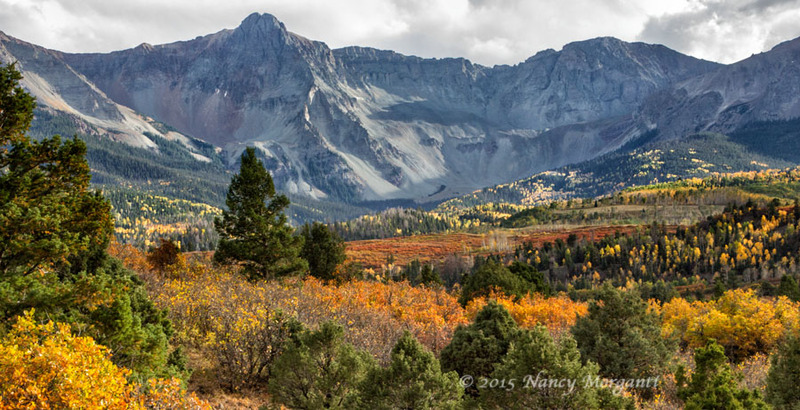 Wilson Peak - Last Dollar Road - Ridgway, Colorado : One of the many mountain vistas found along Last Dollar Road between highway 62 & Telluride. 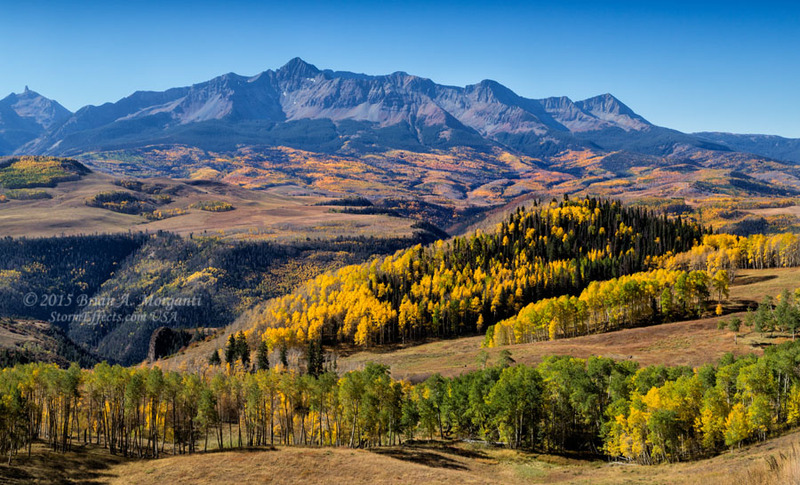 Wilson Peak & Aspen Forests - Last Dollar Road - Telluride, Colorado: Miles of rolling hills filled with colorful aspen forests lead up to the peak of Mount Wilson. 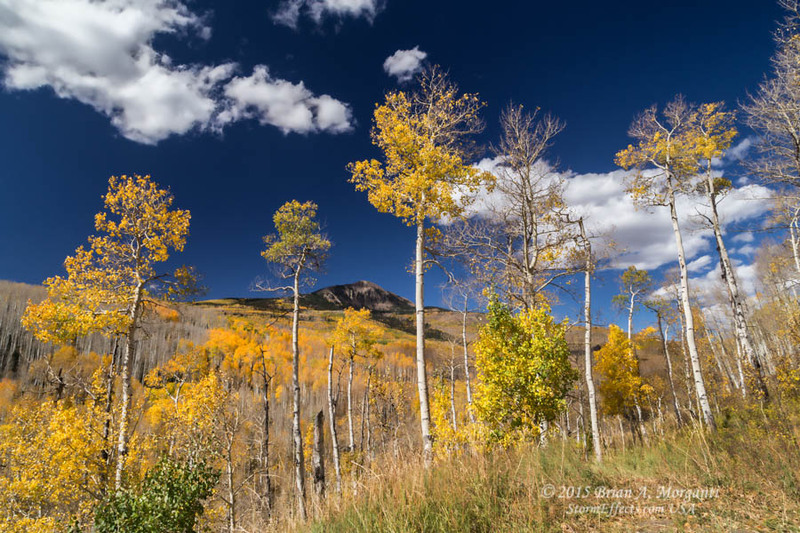 Aspen Framed - Forest Road 618 - Telluride, Colorado: Aspens reach for the sky during a warm October afternoon near Woods Lake, Colorado. 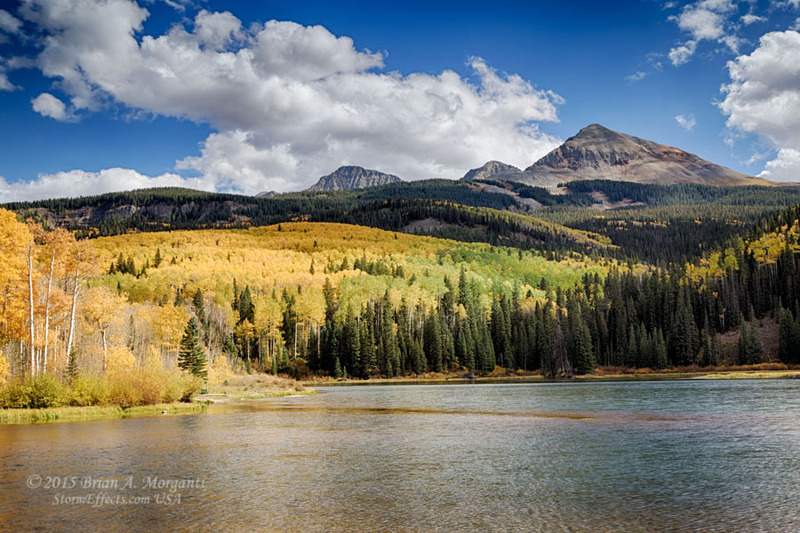 Woods Lake - Telluride, Colorado: Warm Aspens contrast with the cool waters of Woods Lake during a late October afternoon. 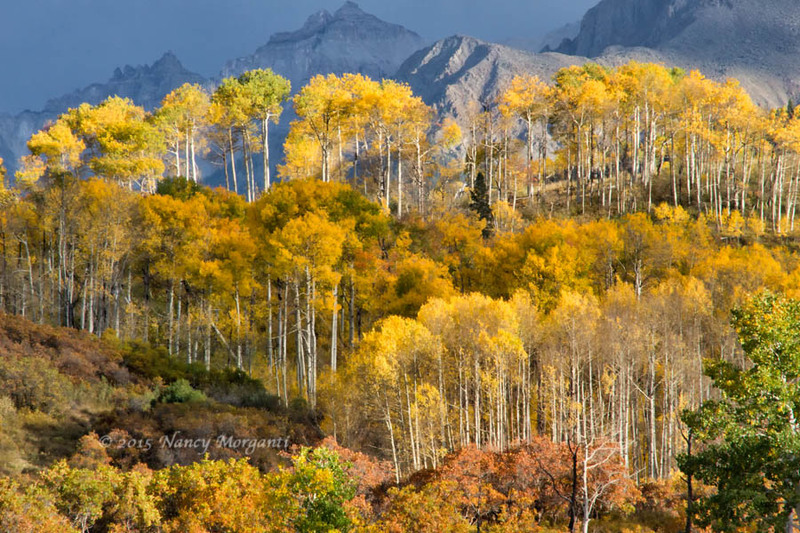 Aspen Beauty - Woods Lake - Telluride, Colorado: Nancy captured this pretty scene near Woods Lake. 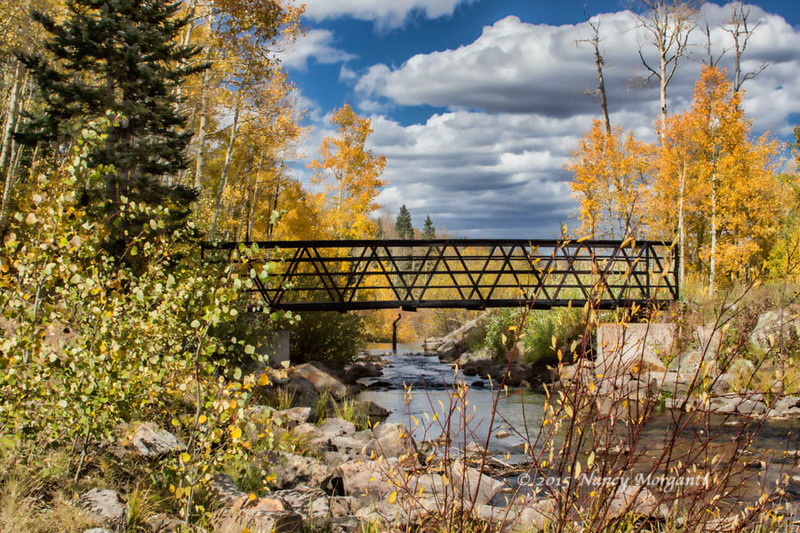 Bridge View - Woods Lake - Telluride, Colorado: A foot bridge crosses a small creek next to Woods Lake. Afternoon Sun - Last Dollar Road - Ridgway, Colorado: A small valley filled with Aspens begins to darken with shadows during the late afternoon. 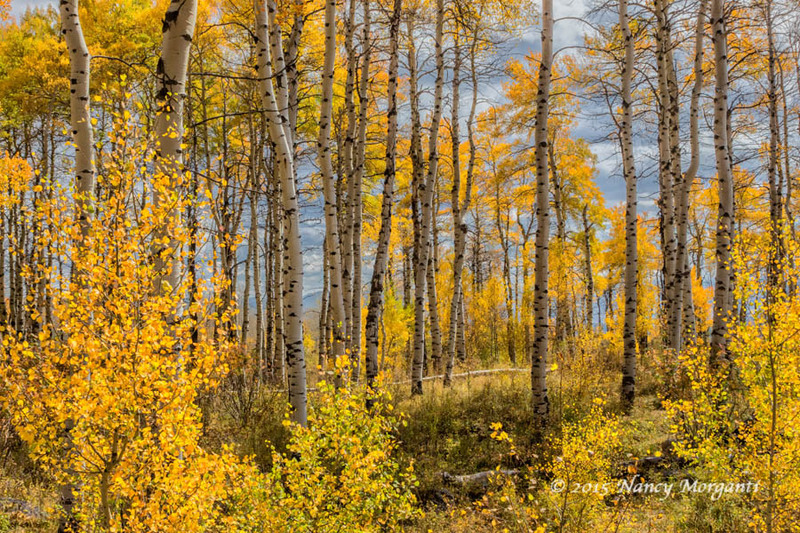 Aspen Blaze - Last Dollar Road - Ridgway, Colorado: Intermittent shafts of sunlight brightly illuminate these Aspens trees beneath a dark overcast sky. 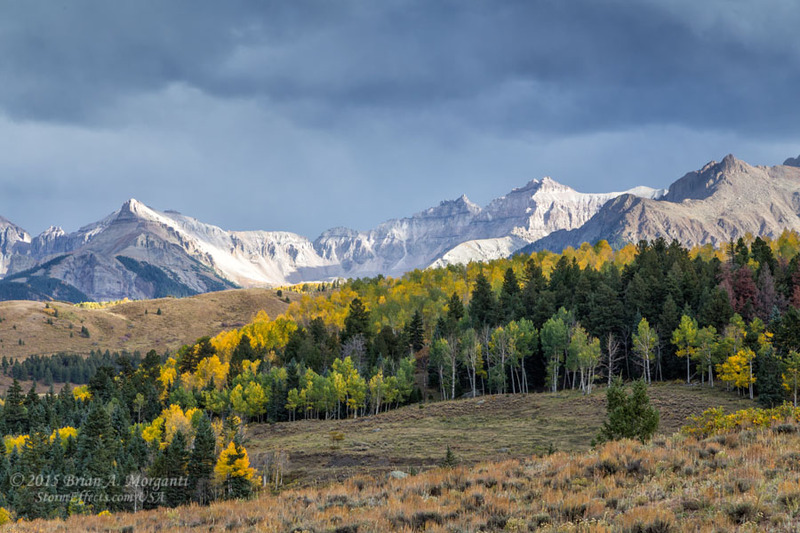 Dallas Divide Sunset - Last Dollar Road - Ridgway, Colorado: The setting sun shining through breaks in the clouds creates a matrix of sun and shadows on the Dallas Divide Mountain range. 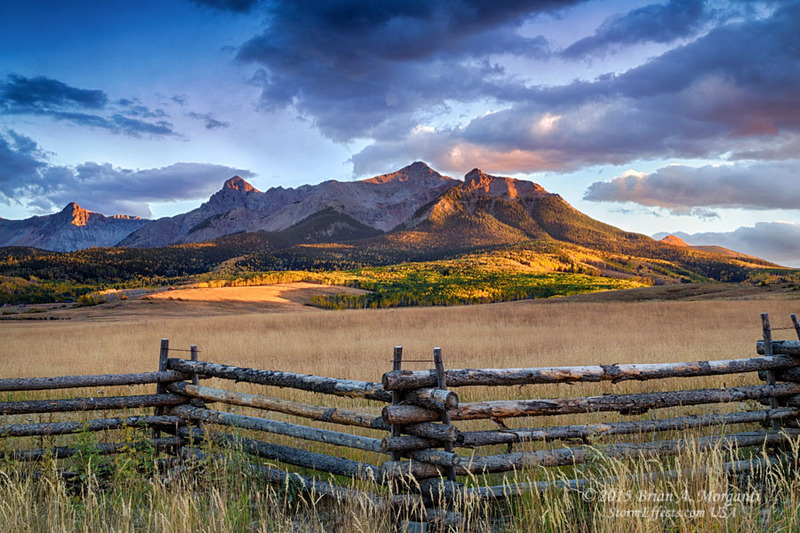 Dallas Divide Alpenglow - Last Dollar Road - Ridgway, Colorado: The final rays of the setting sun illuminate the highest mountain peaks of the Dallas Divide ablaze with a reddish Alpenglow. 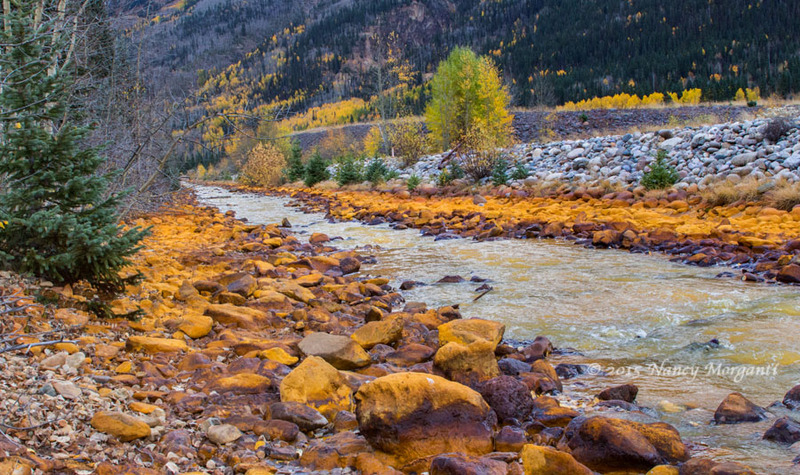 Ironton Creek - Ironton, Colorado: Nancy found these rusted red rocks fascinating along the Ironton Creek not far from the town of Ouray. Treasure Falls - Pagosa Springs, Colorado: This vertical panoramic image shows the entire 105' high Treasure Falls that is located off highway 160 about 15 miles east of Pagosa Springs, Colorado.